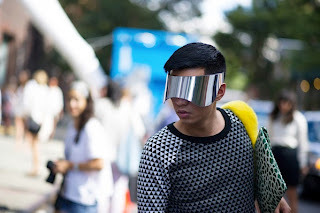 No, I'm not talking the synthesis of some NEW SPACE AGE fabric, but I'm talking the post New York Fashion week phenomenon of protective eye wear. That's right nerds-- it's time to take your lab goggles out on the town. 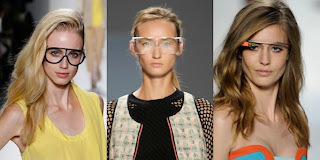 When Milly and Tracy Reese sent models down the runway, something just screamed Goggle's are back! Reminiscent of Seth Green in "Can't Hardly Wait," but more like chic scientists or Grandma's sun visor. I mean those designers are mainstream, and in a mall near you, so if they put their money on the Chic Scientist look-- it must be happening for real. Can we write it off as a runway gimmick? NOPE. Why, you ask? ....because we just got further confirmation that the trend is real from none other than Alex McQueen. Alexander McQueen Mirrored transparent visor ($465) are now SOLD OUT on Net-A-Porter. Kristine's thought: head back to your high school chemistry teacher or your Great Aunt's attic and ask just for a pair. Save yourself a car payment and call it vintage. I am interested to see if it will infiltrate down to the masses and if iterations of it will soon hit the Boston streets. 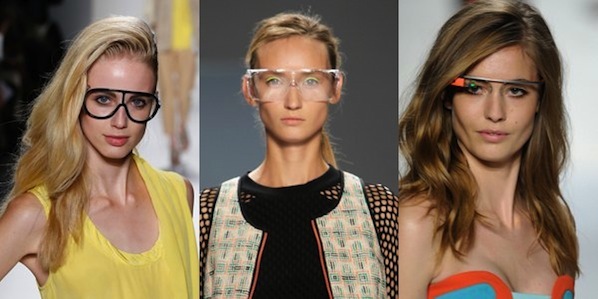 I'm gonna be perfectly honest, the google glasses at DVF freaked me out. I'm not ready for technology that does that quite yet. I like not being a cyborg. lol Really? I love being a cyborg! JK-- but I did just see this comment for some reason! Sry about that! Loved meeting you BTW!